Real-time data streams from our proprietary sensors and other data sources provide you with key performance metrics. M easure traffic flows anywhere there’s a power outlet, then monitor your results on our cloud service. You'll be set up and collecting data in 5 minutes. No technical expertise required. Choose the best location for your business, negotiate a great rental deal, and support your growth strategy – all based on real-world data. Optimize your operations with pedestrian traffic and walk-in rates from your store. Identify the impact of everything from promotions to weather. Understand your commercial property. Maximize your rental income, attract better tenants, and retain the occupants you already have. 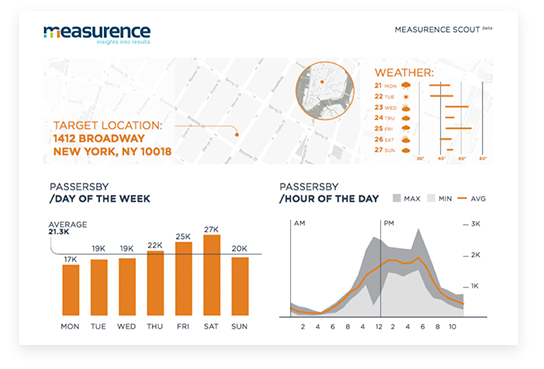 Optimize display placement and design by analyzing traffic data. Improve brand exposure and track conversions with confidence. Track OOH visibility as easily as online. Measure impressions and ROI from billboards, and street furniture, then link it all to location data. Understand your vehicle-based campaign visibility and maximize your return on advertising spend.